"At Ojai Print Works, we offer quality services to local Ojai area clients at reasonable prices. We are LOCALLY owned and OPERATED. Our courteous Printing Service staff have the professional tools and experience necessary to help with all your needs. Call today to get in touch with our staff and to learn more about what we have to offer." I am retired from the Sheriff's Dept. and since then have been the head softball coach at Nordhoff. I have seen a lot of devastation in my career and I pass those experiences on to my players. I encourage them to volunteer and give back. I tell them to extend your hand first to help those before you extend it to ask for something. I have owned my printing business for 13 years now. One thing that I despise is how some take advantage of a devastating situations for a profit. That is why I have always refused to print shirts at large fires which many do. If it were not for the loss of property, or worse, life, interest in the fire would not but nearly as much. Therefore, printing companies/individuals will print shirts up and sell them for large profits. Some times they say "portions of proceeds will go to the fire victims". I had several requests to come up with something to help the local residents in Ventura County. My response was, "I do not get involved with fire shirts." A good friend of mine, Joe Pulido kept forwarding me posts of individuals selling shirts. More I got irritated, the more he kept sending me images of the shirts, how much they were selling them for and what percentage they were giving back. After I got a call from a close friend, Jim Firyhoff (Ojai Police Chief) asking me to think of a way to help. I looked at the many shirts offered. Selling for $20 on up. 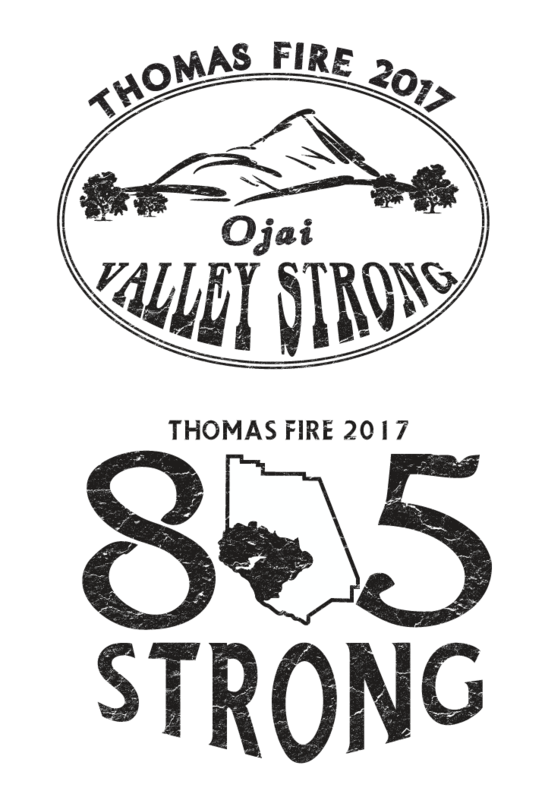 The one that got to me the most was the sweatshirts in simple text of #OJAISTRONG selling for $50 with 20% going to the fire victims. I know what the profit is on the item which is far more than what the donation amount was. Again, if it were not for the devastation these individuals would not be making money. I get it. American is the land of opportunity and each person is entitled to earn an income of their desires. So this moral outlook I have can be argued I suppose. I started doing my research and could not find one legitimate "non-profit" for "fire relief". With that said, where is the so call "donations" going to? If I was going to get involved it was going to be legitimate. I spoke to Teri Wolf with The Help of Ojai. She educated me on their logistics and what they have been doing for the fire victims. Long story short I started this effort by donating over 300 blank shirts, reached out to customers of mine and collected hundreds of dollars to order more blank shirts. Jeri Washburn helped with the design of the Ojai shirt and I did he 805 to represent the county as a whole. I used 100% of the proceeds to go directly to the real fire victims which went to The Help of Ojai. My company did not take any profit or charge for the printing costs. they only charge made was to the Help of Ojai to purchase more blank shirts which was dine at my cost. I brought my mobile printing trailer out to an event at Nordhoff which was one the proudest moments in my career. Some of my softball players donning dust masks along with a few other volunteers such as Suzi Taylor came to help sell shirts. To see a huge line for hours. How patient everyone was. There was approximately 100+ in the line from before 10am to 3pm. We sold out of most shirts and took orders. Teri purchased more shirts and continued to sell them until it became too much of a burden on the Thrift Store staff. To date, we raised approximately $13,000 off a shirt selling for $10 and 100% of the proceeds went towards a true non-profit that serves the local residence. I can't tell you how much money I lost during that time period, however, it was the slowest time on my books in 13 years. Lack of wealth on my pocket does not compare to the riches in my heart to know that many were help by something I did.